Remember those pictures of parched lawns and bone-dry unplanted fields when it seemed that Californians could only pray for rain and snow? Now thanks to one of the wettest winters on record, scientists say that the snowpack along the Sierra Nevada mountain range is a whopping 183 percent of average (updated Thursday). 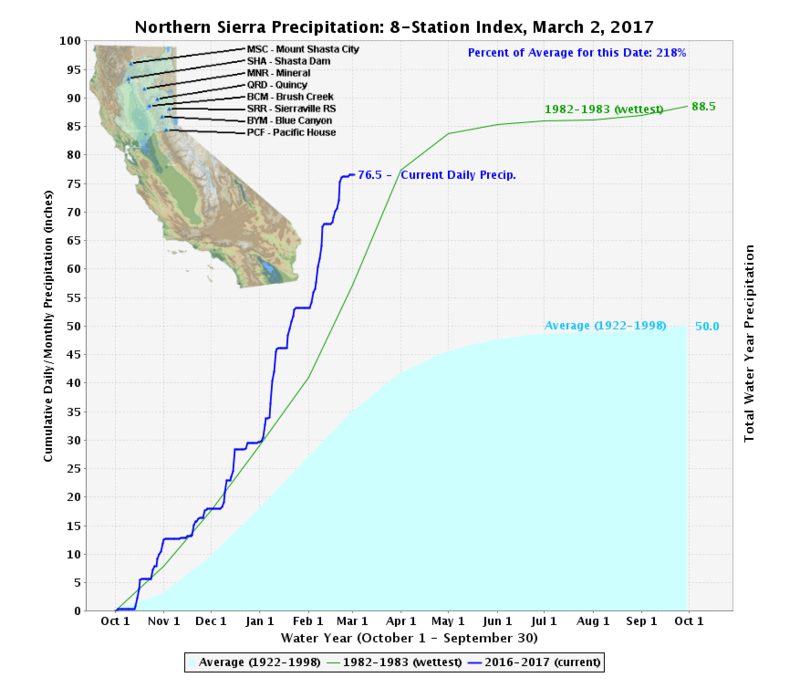 The snowpack over most of the Sierra is on track to surpass the El Niño winter of 1982-83, currently the state's wettest on record. That's important because the runoff from the Sierra snowpack provides one-third of all of California's water. NPR's Kirk Siegler was up in the mountains Wednesday near the Sierra-at-Tahoe ski resort, at about 7,000 of elevation, one of many locations where surveyors take their measurements. As he told All Things Considered, "I've been here around this time of year for this for past three years, one year no snow, last year, some and this year it's staggering." Siegler watched as Frank Gerhke, the state's chief snow surveyor, took his reading with the help of a long cylindrical gauge. Gehrke says it's the first time since 2011 that he's had to add an extension to the aluminum tube to measure snow depth. 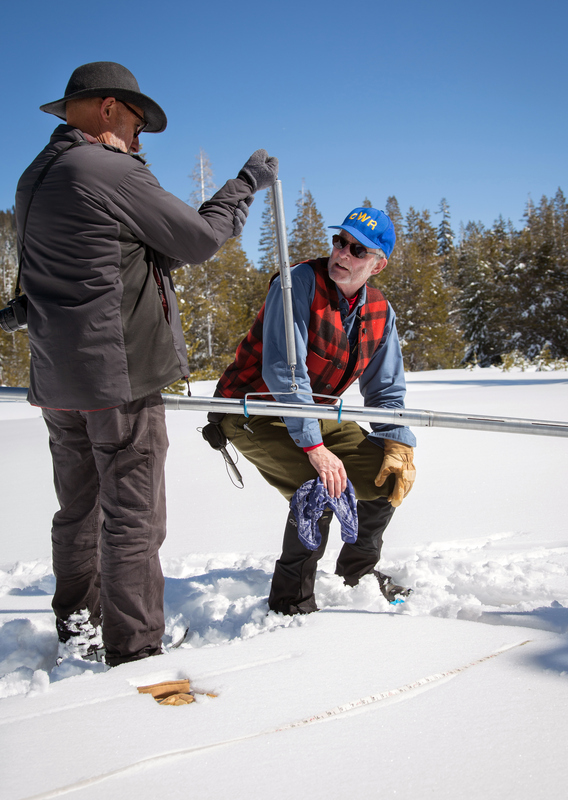 "Gehrke and his team take manual measurements here and combine it with electronic data from monitoring sites across High Sierra and they hand that over to reservoir operators and farms and cities downstream in the form of a forecast to know just how much water they'll get out of this snow in coming months," said Siegler. But California's five year drought hasn't been declared officially over yet. The snowpack will be measured again in April when the snowpack is usually considered to peak. Gov. Jerry Brown has said he'll wait for that measurement before making a call on the drought and the water conservation measures that were implemented as a result of the dry years. All of the snow and rain have created other problems. State reservoirs are at capacity. Problems at the Oroville dam caused officials to evacuate nearly 200,000 people for fear that an emergency spillway would fail. Damage from flooding in other parts of the state will cost $1 billion, according to state officials cited by the Associated Press. 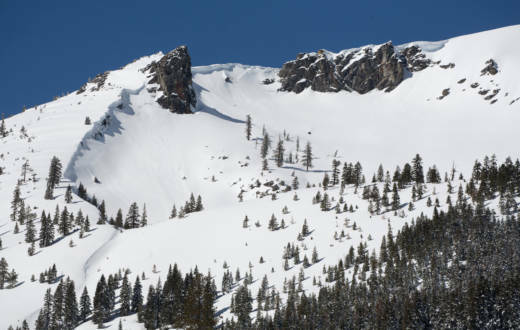 And while Gehrke says the snowpack has hit a "plateau," as storms have subsided, Siegler points out that winter isn't over yet. "A big question is what's going to happen when all this snow melts, and if we were to get a big warming trend all at once, that's a lot more water and run off coming down," he said. © 2017 NPR. To see more, visit http://www.npr.org/.